According to a recent Gartner survey, most consumers are using their tablets at home, in the living room, using them to check email and social networks, read the news and play games. Now Sony wants your tablet to control your home entertainment system. 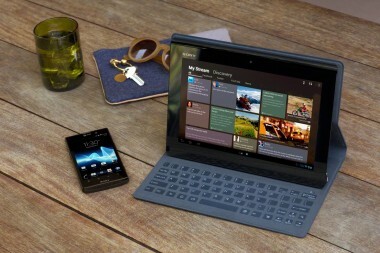 Enter the new Sony Xperia Tablet S.
Due out on Sept. 7, the Android tablet comes preloaded with a universal remote control app that allows you to control your TV and cable box right from the device. It’s a feature that was first introduced on the Sony Tablet S, but the app now supports multiple devices, including Blu-ray players and audio equipment, from most brands. Users can program commands into the app, so they can turn on the TV or play music with just a tap of the screen. Sony is also aiming to make the TV-watching experience more social with a new app called Watch Now. Downloadable from the Google Play store, the software offers a visual program guide and provides show recommendations based on personal preference. In addition, you’ll be able to share and comment on what you’re watching via Twitter, Facebook and GetGlue. As for the tablet itself, the Xperia S has a 9.4-inch, 1,280 x 800-pixel touchscreen, with a splashproof guard that registers your touches even if your fingers are wet. It has a rather unique design where the top of the device looks like it’s folded over, which the company says provides a more comfortable grip and feel. The Wi-Fi-only tablet will ship running Android 4.0 Ice Cream Sandwich, and includes a multitasking feature called Small Apps and Guest Mode. With Small Apps, you can work in one program and then launch another in a smaller window to use at the same time. Meanwhile, Guest Mode allows you to manage which applications and widgets are accessible to others, in case someone else wants to use your tablet. Other notables include an eight-megapixel camera on back, a front-facing one-megapixel camera, an HDMI port and an SD card slot. 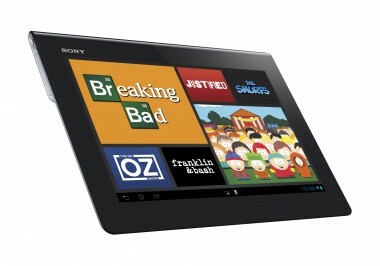 The Sony Xperia Tablet S will come in 16 gigabyte, 32GB and 64GB versions at $399, $499 and $599, respectively. They are available for preorder today from Sony’s Web site. There will also be a number of compatible accessories, such as a cover with keyboard ($100), and a docking stand ($100). Going forward, Sony’s tablet will live under the Xperia brand name, along with the company’s smartphones, and will share a more user-consistent experience across all devices.